I have been noticing in one of my tanks that has pool filter sand, the sand at the bottom of the tank it turning blackish gray. The tank does not smell and after I do a water siphon, the sand from the bottom comes up and I see the color change. After about 12 hours or so the black sand disappears. Any ideas? I had the same problem with my fine play sand. I figured it was harmful for the fish, so I would take it out. I barely have any left in that tank. I haven't had this problem with my other sand. This is the what comes up after do a gravel sweep. And here is a shot from the under side of the tank. I plan on scooping the black sand out. Can anybody tell me what this is and what caused it? Any good ideas for removing the sand with the fish and some water in the tank? Last edited by Jshakour on Mon Jan 31, 2011 9:44 pm, edited 1 time in total. Black spots in the sand are indicative of a hydrogen sulfide gas buildup that grows in anaerobic conditions. Stirring your sand periodically will keep that from happening, as well as making sure it's not packed down too tight. It's not usually dangerous to fish unless you have a LOT of it in your tank. Stir sand during water changes and you'll usually prevent it from building up. I do have about a good inch or so of sand, Ill remove the blacken sand and i will not add anymore and see what happens. How thick/deep is the sand in your tank? 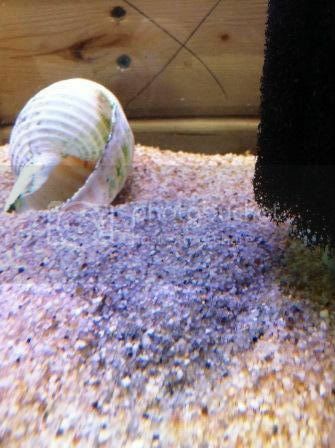 Dan Woodland wrote: How thick/deep is the sand in your tank? its about a good inch. I experienced the same thing in the past. Since then I use a bit less sand, just below the tank frame, and for tanks that had/have that issue I usually vacuum the sand more regularly than normal. The bacteria/algae etc you see is not harmful to the fish just unsightly and I believe it comes from the sand being densely packed over time where things trapped below the surface rot. Jshakour wrote: Stirring your sand periodically will keep that from happening, as well as making sure it's not packed down too tight. It's not usually dangerous to fish unless you have a LOT of it in your tank. Stir sand during water changes and you'll usually prevent it from building up. This is the best way to prevent this condition. I like a thick layer of silica sand in my tanks, especially for the Eartheaters like Geophagus and Satanoperca. During my weekly water changes, I take the grip end of a wooden spoon and carefully stir the whole substrate. Since I do this, I never had this problem again. The same thing is happening to me. Is there something about to worry? How you resolved this? Is there need to change the sand? Please help me with this. Depending on how long the tank has been set up, the black veins could be nitrifying bacteria setting up shop in less-dense pockets of your sand. 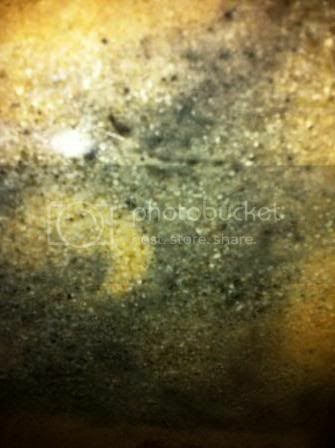 If it is anaerobic bacteria, just mix the sand layer lightly to evict them from their homes. I'm also facing the same problem and googled lot of related things on internet and finally decided to clean up because i think it is not good for fish. As jambo said that i have also read most of the places. So tomorrow is the day i ll take it out all the sands.